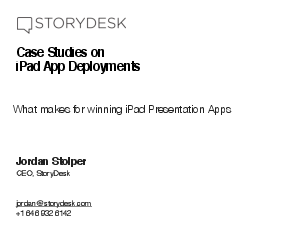 This white paper explains how to leverage the iPad to deliver stunning, memorable sales presentations. Case studies graphics will help you understand what works and what doesn't in bringing your company's sales and marketing content to the iPad. This white paper is an ideal, easy-to-read primer for both non-technical and technical executives trying to make sense of how their enterprise can take advantage of a technology that's inherently interactive, mobile, and transactional.